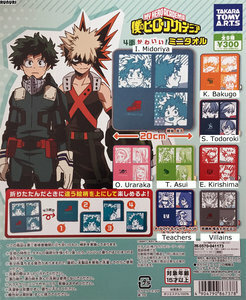 The size of these very cute mini towels of My Hero Academia are approx. 20 H x 20 W (cm). Notice: We will take out the mini towel out of its packaging (plastic) so that you don't have to pay higher shipping costs. Notice: The color of these mini towels on the picture can slightly differ with the real ones because of camera (lighting effects). The capsule is not included when the mini towel is shipped in a cushioned enveloppe or a mail box.